Myanmar's Parliament Elects First Civilian President In Decades : The Two-Way U Htin Kyaw is a close ally of democracy icon Aung San Suu Kyi, who was barred from running herself by the country's constitution. U Htin Kyaw (left), newly elected president of Myanmar, walks with National League for Democracy leader Aung San Suu Kyi at Myanmar's Parliament in Naypyitaw on Tuesday. 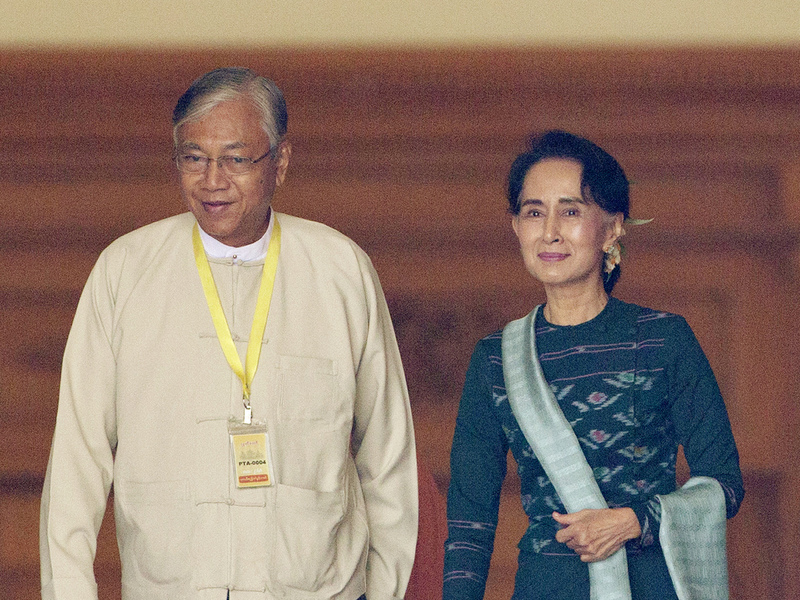 Myanmar has elected its first civilian president after decades of military rule. U Htin Kyaw, a close ally of Nobel laureate and democracy icon Aung San Suu Kyi, won the legislature's vote. Suu Kyi was barred from running herself by the country's constitution — drafted by the former military leaders — because she has two foreign sons. Htin Kyaw won 360 of the 652 votes cast by the two houses of Parliament. Suu Kyi's party, the National League for Democracy, won "80 percent of the seats up for grabs" in November, as we reported. "Lawmakers applauded as the vote count confirmed 70-year-old U Htin Kyaw as president. The legislature also confirmed two vice presidents, one each from the ruling and opposition parties. "U Htin Kyaw has never held a public office. He's been a member of Aung San Suu Kyi's inner circle for years, sometimes serving as her driver." And Suu Kyi has made it clear that Kyaw will serve as her proxy, Anthony says. "Today's result is because of the love of people for her. It is the victory of my sister Aung San Suu Kyi," Htin Kyaw said after the vote, according to Reuters. "Suu Kyi was awarded the Nobel Peace Prize [in 1991] and it was around this time that Htin Kyaw — then a computer programmer-turned-bureaucrat — became involved in party work. His father-in-law was already a prominent NLD leader and his wife a member. "Htin Kyaw, who had known Suu Kyi since grade school, became her confidant and adviser on foreign relations." As we reported, Suu Kyi has apologized to her supporters for not becoming president. And she has previously said she'll be "above the president," adding: "I'll run the government and we'll have a president who will work in accordance with the policies of the NLD." While these elections are an indication that the military has loosened its grip on power, the generals continue to hold significant sway. As AP reports, the constitutional clause that barred Suu Kyi from running for president "is widely seen as having been written by the military with Suu Kyi in mind." "It controls the home, defense and border-affairs ministries, as well as the country's security forces and civil service. It can thus frustrate the NLD's attempts at reform. Revising the constitution may prove even more difficult. That would require a parliamentary supermajority exceeding 75%. The army reserved seats give it a veto. ... In a national crisis, as defined by the generals, the army can still legally seize control again."